What’s North Carolina got that we ain’t got? Solar. Renewable energy advocates were delighted by the news last week that American University, George Washington University, and George Washington University Hospital, all in DC, have contracted to buy 52 megawatts of solar power from three projects to be built in North Carolina. The projects will be owned and operated by Duke Energy. It’s one of the biggest solar deals in the East, and puts the two universities and the hospital at the forefront of nonprofit institutions. Many universities have been debating the merits of divesting their endowments from fossil fuels, an important but mostly symbolic move in the fight against global warming. But buying solar for campus operations and investing in solar projects on campus actually carries the ball forward. 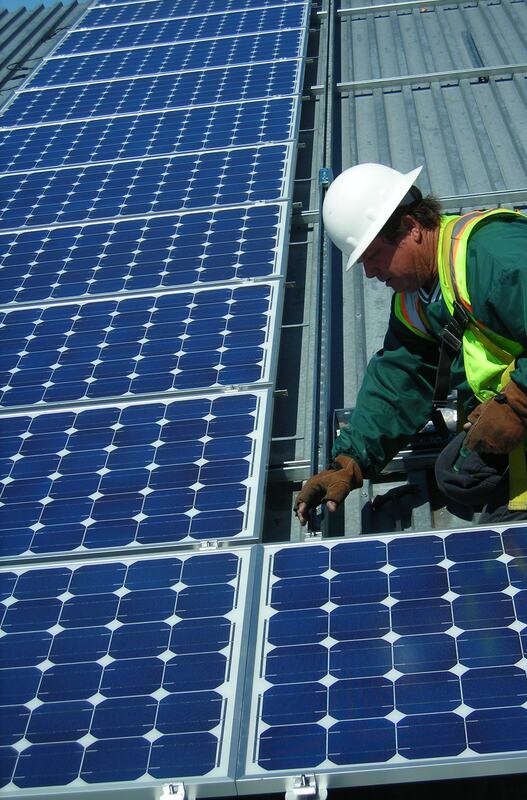 It reduces fossil fuel use, helps the solar industry grow, and supports local jobs. Although in this case, the jobs aren’t local. The astute reader will have noticed that an entire state lies between the District of Columbia and North Carolina, but it got skipped over in this deal. A project like this one in Virginia would have about quadrupled our entire installed solar capacity to date. We, too, have under-utilized agricultural land and communities pining for new additions to their tax base, and we have solar installers working in every corner of Virginia. We could have done this. So what has North Carolina got that we ain’t got? Pro-solar policies, for one thing. North Carolina offers a 35% tax credit that is driving the huge growth in solar in the state; North Carolina has about thirty times more solar than Virginia. The credit probably explains how the universities and the hospital could be promised a price for solar electricity that will be less than the price for regular “brown” power. As word of this gets around, there will be a lot of other nonprofits looking at this deal and considering similar projects for themselves. North Carolina will see even more activity like this in the future—meaning it will continue to benefit from growth in the solar industry, creating jobs and bringing in new revenue. North Carolina’s Duke Energy also seems to be more interested in developing solar in its home state than is Dominion Virginia Power. Duke is no angel—like Dominion, it uses its membership in the American Legislative Exchange Council (ALEC) to concoct attacks on customer-owned solar. But Duke has signed on to own and operate the two universities’ projects, while Dominion busies itself complaining about other North Carolina solar projects. Meanwhile, back in Virginia, Dominion brags that it intends to install an 800-kilowatt solar system on two buildings in Sterling. News reports put the price tag at $2.5 million, or $3.125 per watt, for what Dominion says will be the biggest rooftop solar installation in Virginia. Of course, it’s only the state’s biggest rooftop system because Dominion’s customers face a 500-kW cap on the size of solar projects they can net meter under a Virginia law that Dominion fights hard to maintain. This low cap is one more barrier for Virginia. That “commitment to understanding” is a long way from a commitment to supporting a vibrant solar market in Virginia. That’s something we have yet to see from Dominion. And in case you’re wondering, the project will be built by—ahem—a North Carolina developer. This entry was posted in Renewable energy, Solar and tagged American University, Dominion Power, Duke Power, George Washington University, North Carolina, solar, Virginia. Bookmark the permalink. It certainly is surprising that my new state has the distinction of solar leadership, given that the demeanor of Duke is a lot like that of Dominion Resources. Today’s Charlotte Observer has a story about the struggles of solar developers trying to get Duke to agree to reasonable terms for the required power purchase agreement. The solar guys would like to raise the threshold from 5 to 10 MW for projects to be eligible for pre-approved rates and contract terms, while Duke would lower it to 100 kw. The NC has had to referee numerous situations. Likewise for residential solar, the Utilities Commission required Duke to offer net metering, but not so for independent Co-ops. When the Sierra Club and other partners rolled out their “Solarize Charlotte” campaign, I signed up quick. But when I got my analysis from the installer, I noted they assumed I was a Duke customer, but I am not. After several weeks of waiting to verify the situation, I got a letter saying the Co-op would only pay 3.7 cents per kwhr. I am largely left out in the cold, or the shade, on this. But perhaps there is a brighter future in VA if your Governor appoints some progressive utility commissioners. Another contrast between the states is that my my Governor gained a lot of corporate experience at . . . . . Duke Energy!